This past few months has caused me to go deeply into how logic and reason can block us from accessing all that we are. I have always known that we access Intuition by releasing the need to be right and the usual reasoning functions of the mind. ​When heart rhythms were monitored love and appreciation created the most coherent, ordered sine wavelike patterns. Feelings of frustration create a disordered or incoherent waveform, characterized by an irregular, jerky pattern. What we are feeling and what we are thinking has a direct effect on heart function. When we are not in a loving state, (i.e. angry or frustrated) we enter into a lower vibratory state, the heart is not functioning optimally and we have difficulty accessing our true nature. The mind/body responds with stress and illness sets in. Positive thoughts and emotions are essential in keeping the body healthy. If we constantly focus on past hurts and betrayals the heart literally closes to protect itself from all the negative processing. The pericardium (heart protector muscle) hardens to protect the heart, leaving us feeling disconnected and separate. If we get out of our minds and all the reasons why we should be angry and frustrated by the people and situations in our lives we can enter into the heart and learn to love beyond reason. I know this can be very hard if we reason that we have been wronged. Someone who has been abused may not see any logical reason to forgive and let go, but it is important to understand that when we forgive someone, it does not mean we condone their behaviour. What it does mean is that we will no longer carry the pain of the experience in our own bodies. The way to love beyond reason is to LET GO!... let go of the stories, the dramas, the excuses, the justifications of who is right and who is wrong. Our intellect has held us captive by making us think that we need a reason to be loving and forgiving. The main reason to be forgiving is that if you carry resentment or anger towards another person, you are harming your own well being. Destroying the cells in your body and in effect giving yourself a liberal dose of poison. Self love is just as important as loving another. Loving beyond reason does not mean that you condone bad behaviour. If you are in a toxic relationship love yourself enough to plot a new course, get help or get out! Take the time now and give this gift to yourself… Go into your heart, see and feel the truth of your heart. Go into the sacred chamber of your heart and ignite the flame upon the altar. Your heart is that holographic cell in the body of God; your heart contains the map of the universe, all universes, of the ONE. That is who you are and the miracle of this message is the same for all of us. Sit quietly and breathe into your heart. Imagine that your breath is coming in and out of your heart. Keep your attention in your heart as you breathe in think of all the beautiful things in your life. Soften into your heart as you receive these thoughts into your heart and then breathe them out as an expression of love. As you breathe connect to the tender moments in your life, with those who mean the most to you or the most exquisite expressions of nature. Do this on a regular basis and your heart will respond. You have no idea how sacred you are and how inseparably connected you are to all that is sacred. You are a unique expression with the ability to be a living bridge of light between heaven and earth. Choose to live as LOVE. You are a perfect soul, you are love embodied in form. You are here to bring love to the earth and to be that love. Choose to live as love… choose to Love Beyond All Reason. We each have the ability to radiate a love so powerful, so immense, so unconditional that it will lift the entire planet. Any small change you make in your consciousness shifts the entire world. You have the power to choose to make changes in your life activating creational waves of love and light throughout the universe. Allow your soul the freedom to express love in everything you do. You are here for the purpose of being a vessel of love to all the earth. Breathe into your heart and listen to the harmony of your heart song inviting you to love, inviting you to allow yourself to be loved, and inviting you to become love. No matter what the appearances, you have always been love. The only true power is love... All else is illusion. Once this is fully realized you will magnetize more love into your life. 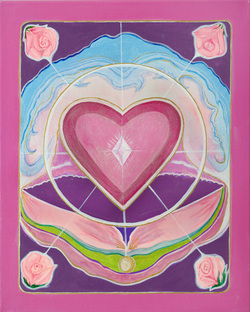 By breathing from the heart you expand your heart weave transforming pain into beauty; sorrow into joy; feel the love of who you are expressing itself with the love of all the highest Light Beings of the Universe. Everything is love and everything has always been love. Let the illusions fall away as you surrender deeply into the love. Surrender all that you are into the love… Love Beyond Reason. YES!